Metro Rail News: Ahmedabad Metro started its first trial run on February 6th, 2019. When will it be commercially open to the general public? Dr. I. P. Gautam: Ahmedabad Metro Rail project held its first trial run on 6th February 2019 and the project was dedicated to the nation by the Hon’ble Prime Minister on 4.3.2019. The commercial service for the public at large has started from 6.3.2019. PM Narendra Modi Flags off Ahmadabad Metro Rail Project on March 4, 2019. Metro Rail News: With other metro starting slew of interesting initiatives, what are the plans for GMRC once the metro rail is made operational? Dr. I. P. Gautam: The first stretch which is now open, i.e., from Apparel Park to Vastral Gam does not have any major origination and destination. Thus, the focus is on attracting people to get them into the habit of using public transport. For this purpose, low fares, in fact the lowest in India, i.e. Rs.5/- for 2.5 kms range and Rs.10/- for 2.5 kms to 7.5 kms distance have been introduced. Provision has been made in station structure for future development of 3 floors of commercial property development. Extra floor provision has been made to be used for property development. Metro Rail News: Could you throw some light on offering last mile connectivity to riders like other metro services are offering to passengers? Dr. 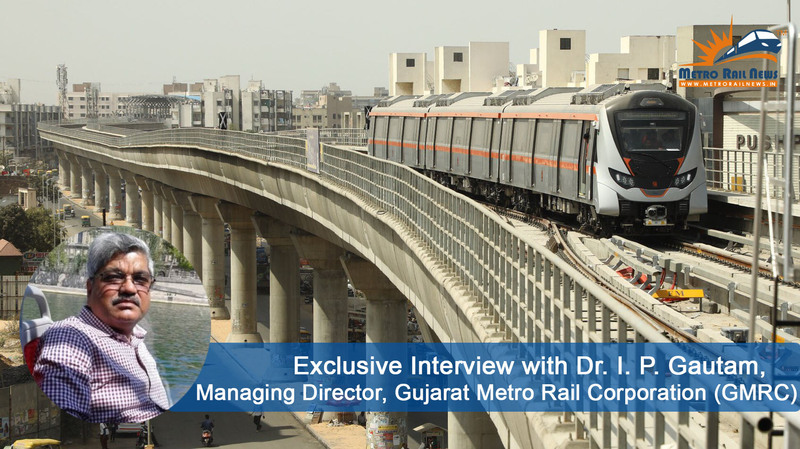 I. P. Gautam: Ahmedabad Gandhinagar Metro Rail has followed network approach where in the entire Phase-I and Phase-II with Bus rapid transit system (BRTS) will function as a single network to achieve last mile connectivity. Other than BRTS system, Ahmedabad Metro is also integrating with Ahmedabad Municipal Transport Service (AMTS), Gujarat State Road Transport Corporation (GSRTC), Indian Railway and High-Speed Rail (HSR). However, the above provisions will be fully functional only when the entire net-work of 40 kms is made operational. Metro Rail News: Could you brief about the phase II project status and challenges. What precautions are taken to safeguard the monuments, if any? Dr. I. P. Gautam: Ahmedabad Gandhinagar Metro Rail Phase – II has been approved by the Central Cabinet Ministry. We don’t need to take any precautions for monuments in Phase-II because there are no monuments falling into the vicinity of Phase-II alignment. Metro Rail News: How prepared is GMRC in terms of dealing with monsoon? Will work be on hold or have you taken some steps to ensure work goes on according to the plan? Dr. I. P. Gautam: We have Monsoon Preparedness Team and Machinery to ensure that the work goes as per the plan. GMRC team and Ahmedabad Municipal Corporation (AMC) team stays on alert at AMC control room for emergency, they constantly monitor the activities and takes timely updates from all the areas. Metro Rail News: What is the status of Surat Metro Rail project? Dr. I. P. Gautam: Detailed Project Report (DPR) has been submitted by DMRC for Surat Metro Rail Project Phase-I. Government Gujarat has already approved it and forwarded it to Central Government for further approval. Surat Metro Rail project Phase – I has been approved by Public Investment Board (PIB) and is awaiting Cabinet sanction. Metro Rail News: What interesting features will GMRC offer to its commuters? Metro Rail News: Can you share some features of the coaches and how different will they be from other metro coaches? Metro Rail News: How does GMRC plan to educate its riders of travelling in metro rail? Dr. I. P. Gautam: As of now GMRC has put up signage and posters at different locations of station to guide passengers/commuter of metro rail, and GMRC operation team staff is available at the station area to guide passengers commuting in Ahmedabad Metro Rail. There are news articles and ads about the metro alignment, ticket charges, technology and all timely updates to make citizens aware about the system and technology adopted by Ahmedabad Metro Rail Project. Metro Rail News: Do you think once metro becomes operational, traffic situation will improve? Dr. I. P. Gautam: Yes, definitely traffic situation will improve in the Ahmedabad city. Rapid urbanization in Ahmedabad has resulted in an exponential increase in vehicle population in our city roads. This has resulted in traffic jams, and major air and sound pollution. A well running Metro Rail can be a major contributor for reducing carbon emissions in Ahmedabad city. Metro Rail News: We would also like to know how our magazine can help in promoting and encouraging metro transport among common public. Do share what edit pieces can help in motivating people to opt for metro over other mean of transport? This interview published in our March 2019 issue.